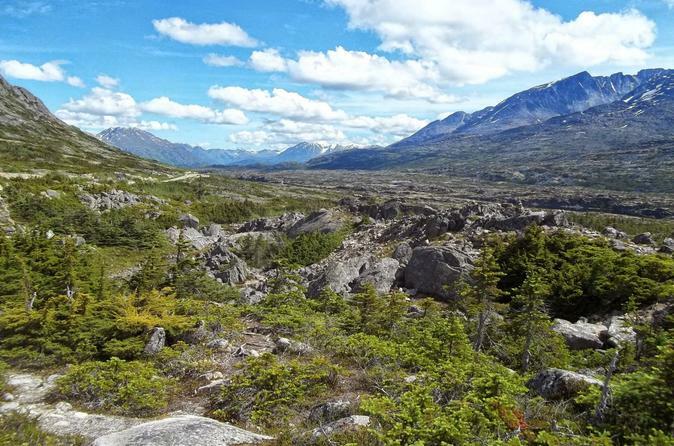 Spend half a day getting to know Skagway and its storied Gold Rush-era. Aboard a comfy coach, wind through Skagway’s Historic District and Wild West landmarks. Hear about the stampeders’ adventures and struggles in their search of fortune. Score incredible views of White Pass Summit and Tormented Valley as you cruise along Klondike Highway. Finish your outing with a sumptuous Alaskan lunch at a Victorian inn that was built during the Gold Rush. Kick off your 4-hour journey with a coach tour of Skagway’s historical district. During the 1898 Klondike Gold Rush, thousands rolled into the port town on their way up to Canada. While Skagway's population today is only about 995 people, the town's colorful history attracts up to a million visitors annually. Travel in and around the downtown area, part of the Klondike Gold Rush National Historical Park, and see well-preserved wooden buildings from the late 1800s such as the Moore House and Cabin and the Mascot Saloon. Then, speed along Klondike Highway up to White Pass Summit, a route that parallels the narrow-gauge tracks of the White Pass Railroad. Reach an elevation of 3,292 feet (1,003 meters) and marvel at stunning views of Tormented Valley, a subarctic alpine tundra with glaciers, waterfalls, snowcapped peaks, and Summit Lake. At the US and Canadian border, take a commemorative photo of the ‘Welcome to Alaska’ sign. Next, it’s back to Skagway for lunch at a historic Victorian inn, which operated as a brothel during the Gold Rush before becoming a family residence and then a boarding house. During your meal (see a sample menu in the Itinerary section below), enjoy live music and art, and learn about the Tlingit, the indigenous people of the region around Skagway. After your meal, walk through the nearby gardens before returning to your original departure point.